Dig in to Rocky Road Parfaits! 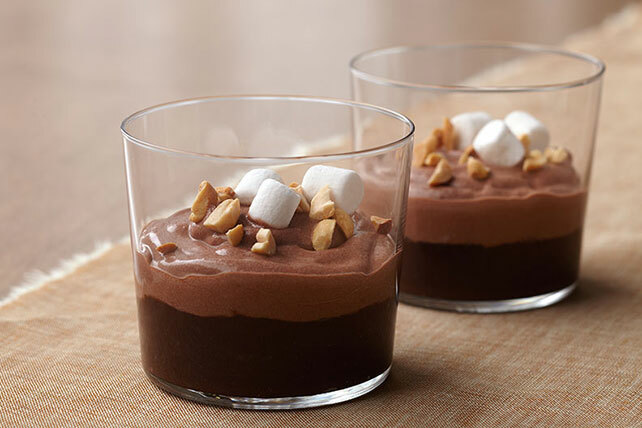 These chocolate-peanut butter-marshmallow Rocky Road Parfaits taste luscious & can be part of your healthy eating plan. Beat pudding mix and milk with whisk 2 min. Spoon 3/4 cup into medium bowl; gently stir in COOL WHIP until blended. Spoon remaining pudding into 4 (6-oz.) parfait glasses or dessert dishes; top with COOL WHIP mixture. Refrigerate 5 min. Use vegetable peeler to shave 1 oz. BAKER'S Semi-Sweet Chocolate into curls. Use to garnish parfaits just before serving. Parfaits can be assembled ahead of time. Prepare as directed, but do not top with marshmallows or nuts. Refrigerate up to 6 hours. Top with marshmallows and nuts just before serving.